Since our kids were little, my friend Bev and I have been taking regular walks together. One of her favorite questions for me is, “What have you been reading?” It’s always fun to describe the books I love to another book lover, and always seems to take the conversation to a deeper level. Books have a way of taking our minds off whatever is worrying us, gently guiding us like a loving and wise friend, to something bigger than ourselves. Here’s a peak at some of the books that are catching my imagination this summer. 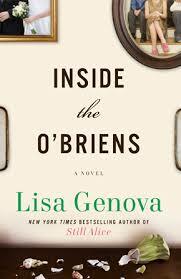 Inside the O’Briens by Lisa Genova — As a teenager, the custodian of my church had a rare disease which made him walk very strangely. He was progressively losing his muscle control, making it look like he was drunk. He had Huntington’s Disease, a lethal neurodegenerative disease with no treatment or cure. What was worse, his children had a 50/50 chance of inheriting it, which some of them did. It is a cruel disease, said to be like having Parkinsons, Alzheimers, and Lou Gehrig’s diseases all at once. When I heard a CBC radio interview with Lisa Genova about a novel she’d written about this disease, I turned up the volume in the car, remembering our church custodian. Lisa Genova, a neuroscientist, has written several books about illnesses and disorders – autism, early onset Alzheimers, brain injury. Still Alice (about Alzheimers) is probably her most famous since it’s been made into a movie. The book did an excellent job of teaching about this disease through the lives of the O’Briens, a family whose cop father develops the disease. While news of this disease, which some have called the worst disease in the world, shakes the family to the core, it is more deeply a story about courage and love. P.S. By now I am on my third Lisa Genova book. Still Alice, and Love Anthony are also informative and deeply engaging, building awareness and compassion and offering hope for all who struggle. 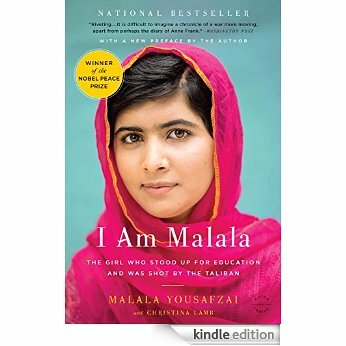 I Am Malala by Malala Yousafzail — I’d received this book as a gift in 2014, but it sat unread on my shelf for over a year. Then this spring we heard Malala being interviewed (for the second time) by John Stewart on “The Daily Show”. Done the day after the tragic Charleston shootings, the interview was so inspiring that I knew it was time to pick up the book and I’m glad I did. Malala of course is the girl who stood up for education in Pakistan and was shot by the Taliban in 2012 when she was 15. She was not expected to survive. Now at 18, she has become a global symbol of peaceful protest and has won the Nobel Peace Prize. She speaks and advocates for education for all. Reading this book reminded me of how much I take for granted every day: freedom of speech, freedom to get an education, freedom of religion. It opened my eyes to life on the other side of the globe, and to political situations that I usually don’t spend much time trying to understand. I also learned more about the deep and profound truths of the Islam faith. Something I love to do after I’ve read a memoir (my favorite genre), is to listen to the person speak on the internet. It’s like meeting someone who just became your hero. So I googled “Malala’s United Nations speech” and listened to the speech she gave on her 16th birthday at the annual UN conference. I’d encourage anyone to listen, it is a powerful and moving testament from a humble, loving person who does not sensationalize what happened to her, but who lives and forgives her enemies. She says she is only “one girl among many” whose lives are affected by terrorism. She is one of my heroes. The book of Revelation — Yes, that’s right, that book at the end of the Christian Bible that make people think of the end of the world, apocalypse, and cartoon like crazy monsters and villains. Instead of taking summers “off”, our tiny church battles hazy lazy summer brain by going full-tilt into study together. Invariably, it ends up being the highlight of the week for us. 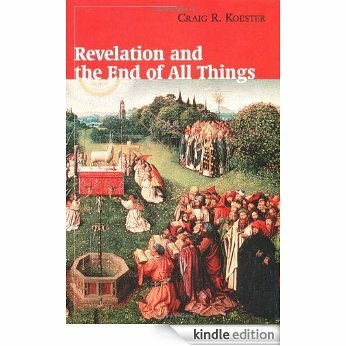 We are half-way through a film course from the “Great Courses” series called “Revelation and the End of All Things”, by Craig Koester. I recommend it highly, especially since Revelation is the most misunderstood and misinterpreted book of the Bible. I myself barely knew much about it and I’ve been a Christian all my life. Koester is a teacher who makes the book clear, engaging and meaningful. When read as a piece of literature, and understood in its historical and cultural context, it has a lot to say even to us modern readers who are often caught in a world torn with conflict and which tempts us to compromise our deepest values. What I’m learning through the film, the accompanying book and the guidance of our resident scholar Paul Patterson, is that Revelation is a hopeful book for anyone who is struggling. Far from telling the future, it is a book that tells even us modern readers what to believe in tough times. At the centre of it all is a King who wins the day not by force, but through love which sacrifices and stands with the weak and powerless (think Aslan for fans of the Chronicles of Narnia). 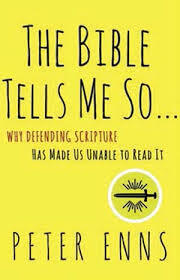 The Bible Tells Me So: Why Defending Scripture Has Made Us Unable to Read It by Peter Enns — Ok, this book might not be for everyone. But if you’re like me, raised on the Bible and sometimes given interpretations that were not the most helpful, this book is a must-read. First of all, the book is incredibly funny, not to mention easy-to-read. I kept thinking as I was reading that it was more like a novel in how engaging and page-turning it is. But even though it’s a fun read, it is backed by reliable research. What he wants you to know is, relax, it’s ok, there’s a way of understanding the Bible that helps us make sense of it. It’s not a rule book or owner’s manual. It’s a collection of stories, known and passed down by God’s people. It’s a living Word, able to stretch across the centuries and be relevant to us today. But we have to know how to read it, and Enns gives a pretty decent set of tools. I’d recommend it to people who identify as Christian or are seeking to know more about Christianity. It’s not, as one blogger put it, for the faint of heart. The idea that the Bible isn’t “perfect” can be deeply unsettling for evangelical Christians. Enns argues that in the Bible, God lets his children tell the stories about him (and tell them imperfectly). God is ok with that, and God is also bigger than those stories.